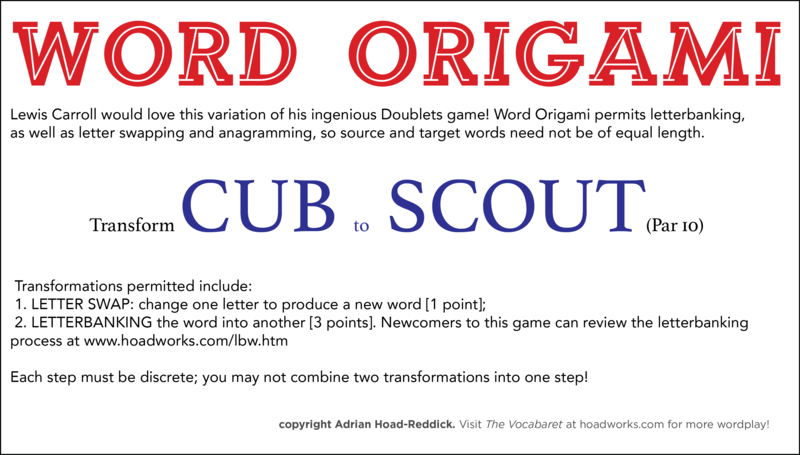 Transform the source word to the target word using letterbanks and letterswapping. Try to match our par rating! Answer from yesterday’s ILL > WIND ORIGAMI: ILL > ILK (LS 1) > INK (LS 2) > KINK (LB 5) > KIND (LS 6) > WIND (LS 7). Transform the source word to the target word using letterswaps and letterbanking. ANSWER from Yesterday’s ENJOY-> LIFE Word Origami: ENJOY – ENVOY (LS 1); ENVOY – ENVOI (LS 2); ENVOI – OVINE (LB 5); OVINE – OPINE (LS 6); OPINE – SPINE (LS 7); SPINE – SEINE (LS 8); SEINE – SINE (LB 11); SINE – LINE (LS 12); LINE – LIFE (LS 13). Transform the source word to the target word using clever letter swaps and letterbanks. Transform the source word to the target word using letterswaps and letterbanks! Can you match par? Transform LUNAR into ECLIPSE using letter swaps and letter banking. If you run out of options at one end, you can always start on the other side and try to meet in the middle. Transform the source word into the target word using letter swaps and letter banks. 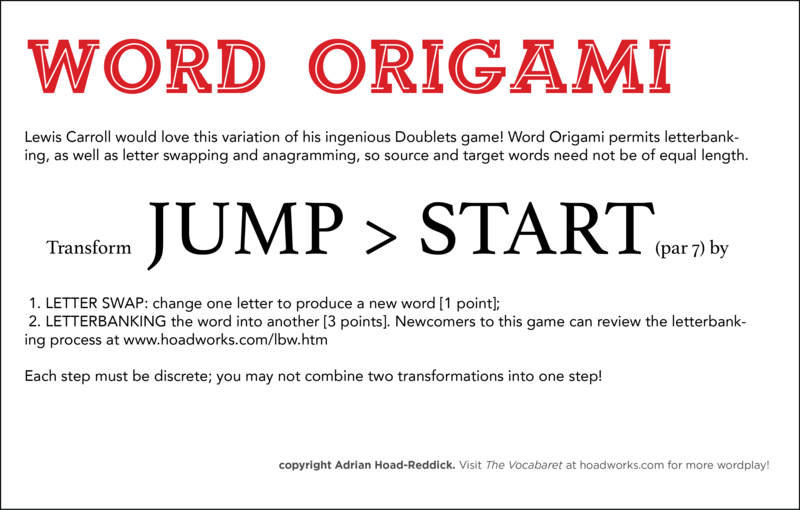 HINT: Remember that ANAGRAMS are a form of letter bank and can be used to shuffle things around en route to a solution. Wend your way from source to target words using letter swaps and letter banking. Match par and feel proud.